Videos and more to celebrate Women’s Equality Day at Suffrage Wagon Cafe! 95th anniversary of the 19th Amendment to the U.S. Constitution on Vimeo. 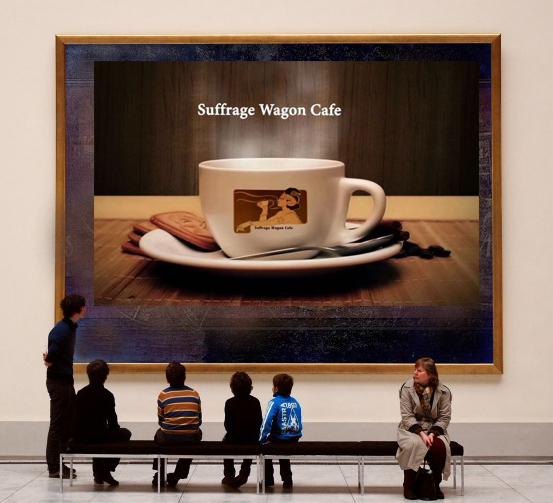 Welcome to Suffrage Wagon Cafe that opened its doors in March 2015 during Women’s History Month. Check for back programs. Honor Bella Abzug. She made sure the U.S. Congress designated August 26th to commemorate the ratification of the 19th Amendment to the U.S. Constitution. August 26th is the 4th of July for American women. That’s why we’re celebrating it at Suffrage Wagon Cafe during August. WATCH FOR UPCOMING AUGUST 26TH EVENTS & CELEBRATIONS! This year, 2015, has been a remarkable year for women’s history. The trend started about two years ago with storytelling about suffrage activists. Then the Womenon20s campaign blew the subject wide open with all the discussions about which women should be nominated to appear on U.S. currency. So many women who’ve been invisible in American history previously are now household words. And the number of books telling the stories about votes for women are enough to make your head spin. Who would have believed it? This August 26th is the 95th anniversary of the 19th Amendment to the U.S. Constitution. That means five more years until the big national suffrage centennial in 2020. This year is a test run, so join in! NEWS NOTES: Suffrage movement historic sites and community organizations have been planning special events for Women’s Equality Day on August 26th and the 95th anniversary of the 19th Amendment. Watch for announcements about an upcoming live feed for a national event that honors women. Celebrate women’s freedom to vote during August with a party, reception, fundraiser, or a cookout. Suffrage Wagon News Channel has resources, videos, audio and more about the women’s suffrage movement. (1.) August 26th in song. The table in the audio image is the freedom table where the Declaration of Rights and Sentiments was drafted in 1848 not far from Seneca Falls, NY. Cross your fingers that it will be on public display as 2020 approaches. We’ll keep you posted. (2.) Rapping and Rolling about August 26th on video. Sound track by T. Fowler. “Standing on the Shoulders” by Earth Mama is a reminder of why we do this work! This was the official theme song of the 75th anniversary of the 19th Amendment to the U.S. Constitution, 20 years ago, and we’re still singing! The National Women’s History Project gift shop has a 95th anniversary button and sticker to add to your women’s suffrage collection. Wear it. Order some for your August 26th event. The National Women’s History Project is celebrating its 35th year in 2015. Follow Suffrage Wagon News Channel on Facebook and Twitter. Quarterly newsletters just by signing up. Suffrage Wagon News Channel has a video platform on Vimeo. Check out SuffrageCentennials.com for news and views about upcoming women’s suffrage centennial events and celebrations. August 8 special program at Suffrage Wagon Cafe to celebrate women’s 4th of July! More from Bess and “Suffrage Storytelling,” plus update on “10 Days in a Madhouse”!